Thank you for taking the time to know a little about me. My name is David Ling and I live in Singapore (means Lion City) [See Map] with my wife Joan and our two sons - Sean, 21 and Mark, 18. This website focuses on a topic most people don't want to talk about. Yet, the topic - the posture one uses to evacuate waste - is important. For it can mean the difference between health and sickness. We ignore it at our own peril. 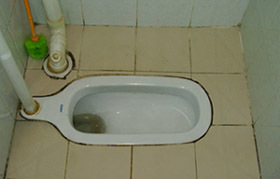 3) A call to bring traditional squatting toilets back into our lives. Since young, I had always answered the call of nature by squatting. In those days (1960s to 1980s), this was what my parents and siblings - and most Singaporeans (and Asians) - did. But when I got married and moved out in 1997, I was no longer able to squat as my new home doesn't have any squat toilet - only two sitting toilets. Sitting doesn't seem or feel feel right for me. I didn't understand or knew why then. I reckoned that I just have to put up with the discomfort and straining that comes with it. It was only five years later, in 2002, that I fully understood why squatting is so much better than sitting. What I learnt compelled me to do something about it. In the end, I chose to use a toilet converter. 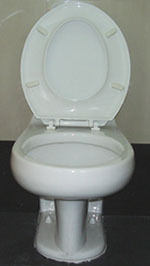 And built this website to spread the truth about sitting toilets and offer a solution. As mentioned earlier, a topic like toileting habits and practices is something very few want to talk about. Yet, like it or not, one has to confront it, as the decision to sit or squat has a direct bearing on one's health. I hope that the information on this site has been helpful, and you would seriously consider - if you currently do not empty your colon in the squatting position - to do so. There's one more thing that I like to share with you. It is the system that I am using to build this website: Site Built It! 3.0 or SBI! 3.0. I understand that you didn't come here to learn about web design, web hosting or how to build a website. But I add this section because I believe that everyone on the Internet ought to know about SBI! 3.0. Very simply, I won't be able to build this website if not for SBI! 3.0. I won't know where to start because I had no training in website design or programming skills. You may have a passion, special interest, unique knowledge, product or service needed by others. The thing is that no one will benefit if you keep it to yourself. Write about it...educate, share and reach out. The best way to do this? Build your own website. But don't make the common mistake of many who chose old fashioned, standard web hosts (1and1, Verisign, Interland, Hostway, bCentral, Yahoo etc). 1) Make Your Content Presell! 2) Make Your Words Sell! 3) Make Your Site Sell! 4) Make Your Knowledge Sell! P.S. The folks at Sitesell, the company behind Site Built It! 3.0, are always on the cutting edge of everything e-commerce. They've helped tens of thousands of ordinary people launch successful Web sites and businesses with Solo Build It! 3.0. You can keep in touch with the latest happenings through the Sitesell Blog.